Originally I wanted to try Portland but he has already been earlier this year, so I booked for newer sister Clipstone. I didn’t know what to expect, but reviews have been mostly positive. The compact dining room was casual with a warm buzz; the open kitchen was sending out waves of mouth-watering perfume as we were seated at the window counter. Our server explained the menu was designed for sharing, so 2 or 3 dishes each should be enough. I started with a light and fruity Cherubino, one of the very wallet-friendly on-tap options, and he with a Chateau Pesquie, probably too acidic for his taste. The scallops were gignormous; easily 3cm thick. The muscular scallops were just cooked to retain its bounce and succulence, showing off its sweet juices and freshness. I secretly wished it could be a tiny bit undercooked, so the centre would be more creamy. 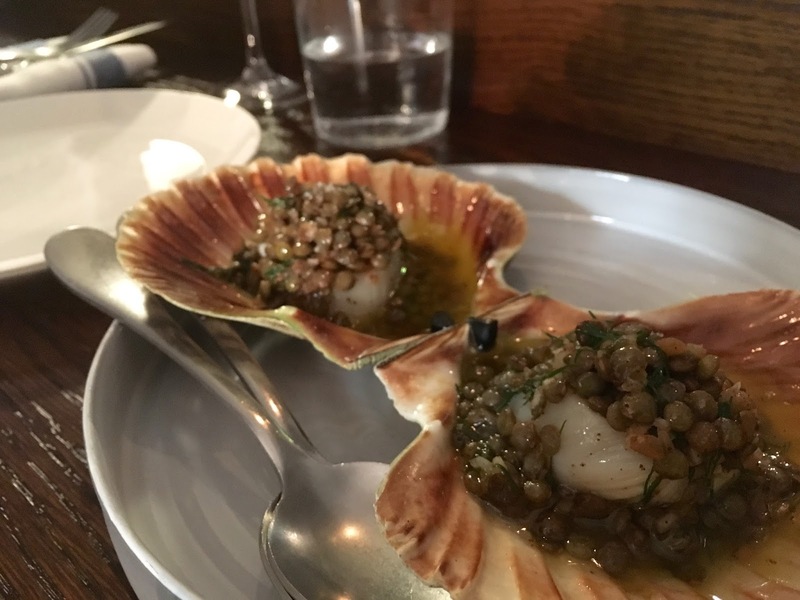 I remain undecided as to whether lentils go particularly well with scallops, but the brown butter sauce and lentil combination was definitely a winner. The squashy wedges of pumpkin were topped with chopped tangy apricots. The morsels of fruit bursted with refreshingly citrusy juice that balanced well with the pumpkin sweetness, harmonised by small blobs of sour cream. The roasted herbs added a beautiful finishing touch for a wholesome after taste. Having seen this as one of the top 10 dishes in 2016 in Timeout, I had to give it a try. The brain was wobbly soft and silky, not dissimilar to a thick block of Japanese tofu, perhaps just with slightly higher density. Its milkiness mixed with the rich bovine gravy that had a gelatinous finish was absolutely delicious. I loved it. Our waitress explained this dish divides people - It's all in the head (pun intended). He struggled with the idea and was visibly reluctant to put the brain-loaded toast into his mouth. The fact he had to convince his own brain that it was tofu to stomach it wasn't worth the effort. We were offered pheasant or Guinea fowl, we opted for pheasant as it's more gamey. 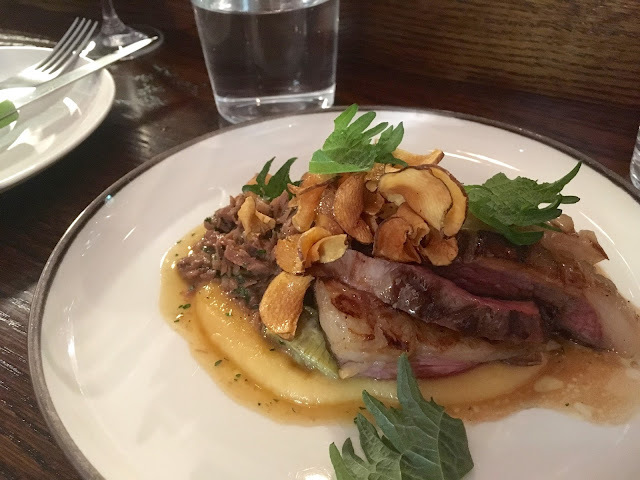 The meat was perfectly roasted to gentle softness, but extremely powerful in flavour, even mildly metallic, paired with earthy and aromatic girolles mushroom and rounded by a savoury meaty jus. It was one of the best winter dishes this year. The lamb was sensational. The meat was blanketed with a layer of fat that gave it a distinctive fragrance. It was roasted to a beautiful medium pink, glistening in its juice and melted grease, remarkably tender as if it was lamb marshmallow. 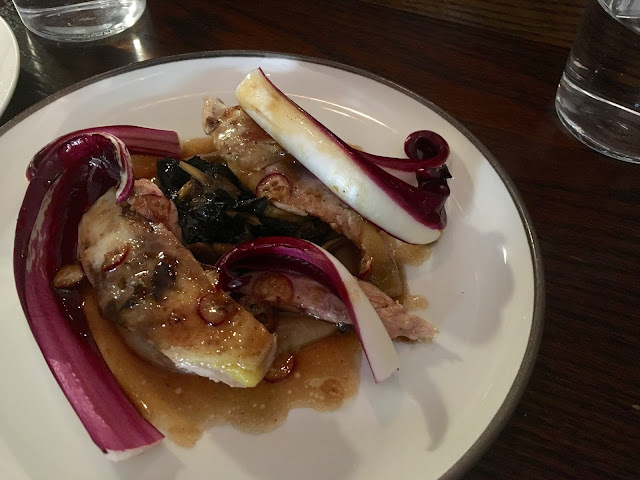 The confit on the side was almost as impressive, packed with meaty essence from the leaner cuts, paired with a velvety parsnip root purée, which was clean and mildly sweet like celeriac. It was a delicately balanced dish. 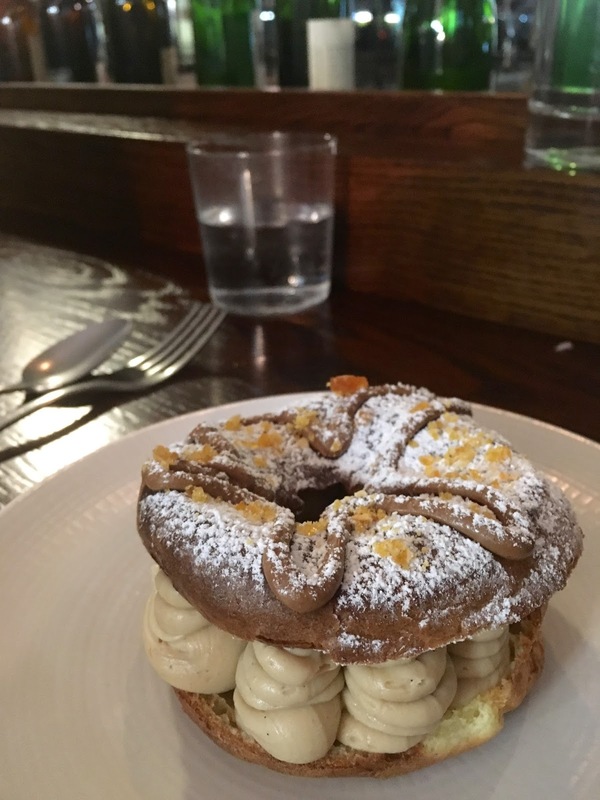 We knew the Paris Brest wouldn't be as good as the one from Les Reves de Patisserie, but it didn't disappoint either. The choux pastry was slightly doughy and lacked a brittle crisp shell, but the thick layer of hazelnut ganache made up for any shortcomings of the pastry; it was airily smooth and oozed nutty perfume. Great finish. We thoroughly enjoyed Clipstone, so much so that he said he'd happily eat here every week (though he quickly backtracked to every month), minus the brain on toast. The dishes were thoughtfully composed with a wide range of ingredients, all beautifully balanced. We agreed it was one of the best restaurants in 2016. We were fans of Honey & Co and so were naturally keen to check out Honey & Smoke when they finally decided to expand. The decor was frankly strange. The plastic table and chairs, shallow alcoves along the wall and strange rail lighting that lit half the room with bright spotlights while keeping the other half in the shadow - there was little ambience to speak of. It reminded me of a student hall common room or the dining area of a very average European hostel, one without much character. Though much more spacious than the cosy Honey & Co, this space didn’t look or feel like a restaurant. The only thing he eats on this nibble platter is olive oil with the bread, which he enjoyed – possibly because he did a 15min dash and was happy to munch on anything. The pickles and olives were nothing special, not sure if we needed it. This was delicious, one of my favourites along with the burnt celeriac. The wedges of pear were sweet, juicy and crunchy with gently charred skin for some smokiness, paired beautifully with the subtly nutty, velvety tahini. Luxuriously rich without the guilt. The soft goats cheese was reined in by the caramelised onions, which wasn’t particularly sweet; the familiar combination of flavours were challenged by the slightly crushed bitter walnut and sprinkles of pomegranates, giving a little twist to the mix. The falafels were alright, not worth writing home about. The tender cauliflower florets were delicious with mango jam, fruity and tangy, neutralised by the omnipresent tahini. We weren’t mad about the chickpeas though; I don’t usually like peas anyway, and the spices came out slightly flat – reminded me of a heartless daal. The beetroot was a hit and miss; the sweet juicy beets were earthy and moreish, but the grapefruits were less enticing. We occasionally stumbled upon a bitterly sour chunk of grapefruit, which made our eyes water a little. The soft discs of celeriac were subtly fragrant and nutty, brought out the luscious richness of the buttery cream, quite simply delightful. Just like Honey & Co, the mezze were mostly excellent. 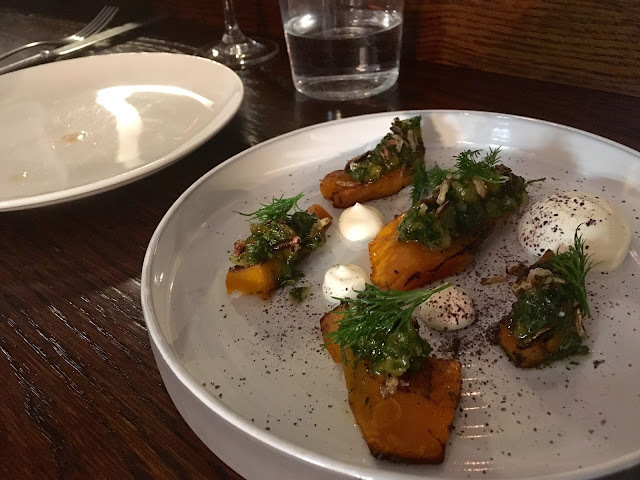 I may even say they are even better here at Honey & Smoke – more sophisticated and more flavoursome. When taking our orders, our server checked with us that we were okay with the pigeon served rare or very pink. Yep - how they should be. Unfortunately it arrived parched and burnt. There was very little pink left when we cut open the bird, it was mostly cooked through with no juice left. The burntness gave the skin an unpleasant bitterness, mixed with the charcoal-ed spices, leaving a horrible taste in mouth that not even the sultana could overcome. We were disappointed and provided feedback to our server that we didn't enjoy the pigeon. The manager was truly apologetic and offered to take the pigeon off the bill. The lamb chops were much better, cooked through but the meat retained its juices with a slightly charred rind of fat. The marinade could have been stronger though, the flavours were drowned by the sweet and tangy fruit. The sides were not too interesting, just a baked sweet potato with a drizzle of lemon and sprinkle of herbs. The lentil and rice mixture was laced with plenty of pungent cumin, a tad too strong for my liking. This dessert alone is a good reason to come back to Honey & Smoke. This is like a deconstructed knafeh - crispy thin vermicelli noodle base soaked with honey, topped with soft creamy cheese. So simple yet so good. The chestnut in the cake was barely noticeable, very moist and soft. The viscous caramel worked well with the dollop of sour cream. I had mixed feelings for Honey & Smoke. Despite the incredibly delectable mezze starters, the mains were less accomplished as Honey & Co, the control on the grill could have been better and the flavours could have been more exciting. Not to mention the lacklustre decor and ambience. Think we'll stick to Honey & Co.
We hadn't plan for a date night; seeing it was an impulsive date, options were limited. 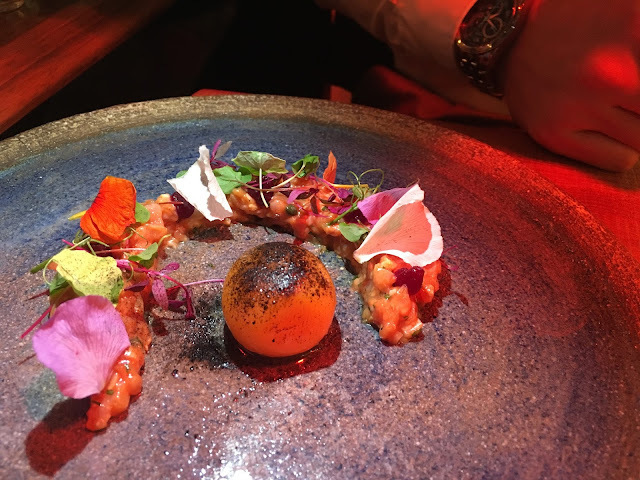 The Frog was one of the hotter restaurants in the East and they have availability on a Friday night (They need credit card details to make a reservation, clearly this puts people off - Londoners have commitment issues). We were seated in the extended atrium - if one could call it that - lit by some uncomfortable red lights. Our table was up against the full length window of the main dining room, which meant it was almost like sharing a table with the people inside; we'd be rubbing shoulders if it wasn't for the window. 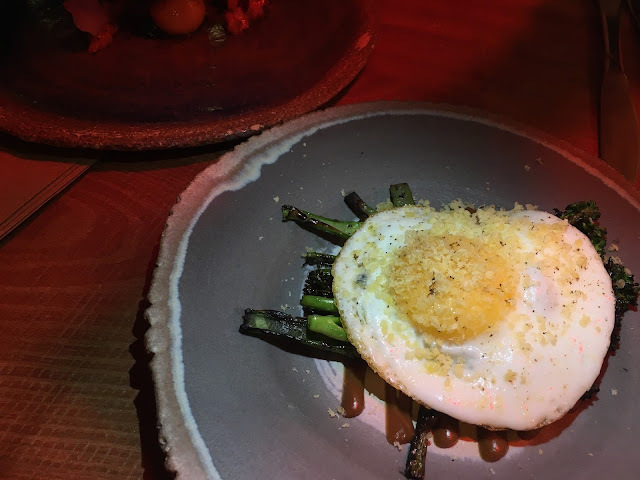 We asked our server for recommendations, she launched into an explanation of how the plates were designed for sharing, and that we should go for the tasting menu. So we asked again... As if to punish me for asking, she began reading out each item on the menu in a jumbled order, testing my literacy. 'Hmmm... Bread, chicken butter is bread served with butter that tastes like chicken... Potato, hummus, truffle is new... Chicken, sweetcorn, curry is like a chicken curry...' Thanks. We sat through the full recital. The snacks started off well. 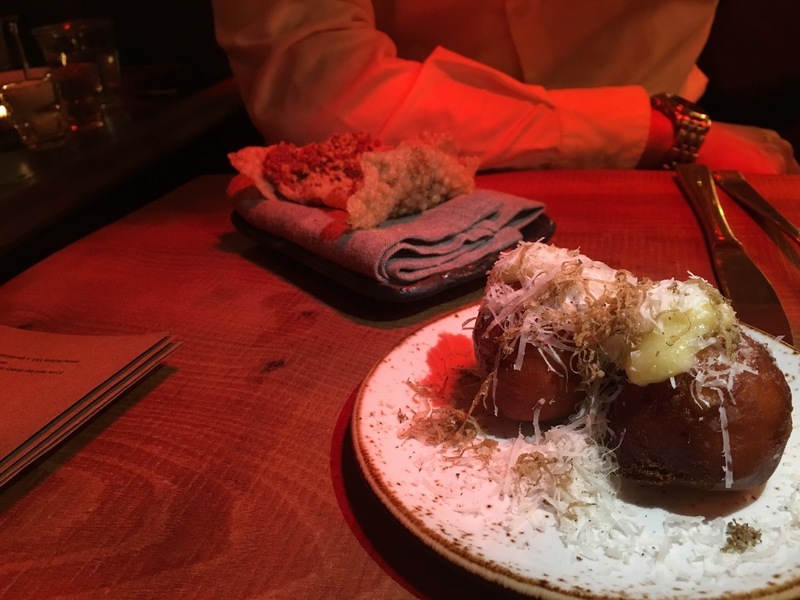 The cheese doughnuts reminded me of deep-fried custard buns in dim sum restaurants, just a savoury version; a crusty shell enveloping an airy bun, filled with melty Gruyere cheese, sprinkled with Parmesan and truffle shavings. Absolutely divine and we could see why they had to put it on the menu twice. 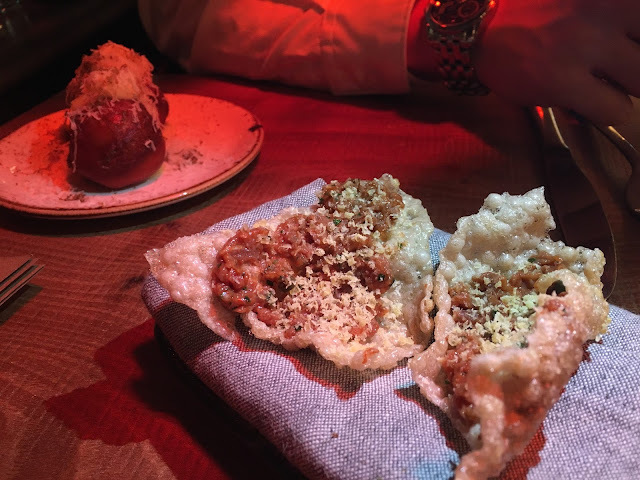 The crackers were smeared with a layer of raw beef minced with chopped chillies, which were more like a playful poke as opposed to a powerful spicy kick. The smooth tartare went well with the brittle base, we both enjoyed it being something different. We couldn't tell where the beer had gone, probably in the crackers. The broccoli was sold under 'garden'. It's a side. And at £8 for 6 pieces of broccoli with a fried egg, it's outrageous. It's broccoli! The egg yolk looks massive right? No, there just wasn't much tartare. It was a regular-sized yolk with a thin stretch of dressed tartare around it. The veal was finely chopped, too smooth and too mild for my taste, I prefer more bounce and more powerful flavours from beef. The BBQ was lost on me. 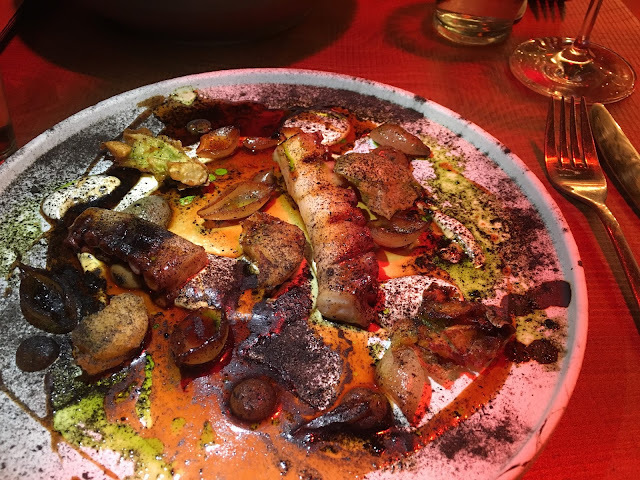 It looked like the kitchen had to spread every single ingredient out to mask how little food there was on the plate - where there was too much blank space, it was dusted with black garlic powder. For £17 we only got a short octopus tentacle and a half, scattered with morsels of potatoes (mostly skin) and droplets of garlic aioli. The octopus was good, bouncy but soft with some char for smokiness, and worked well with the sour cream and purée globules, just needed more substance. The kid goat was very disappointing. 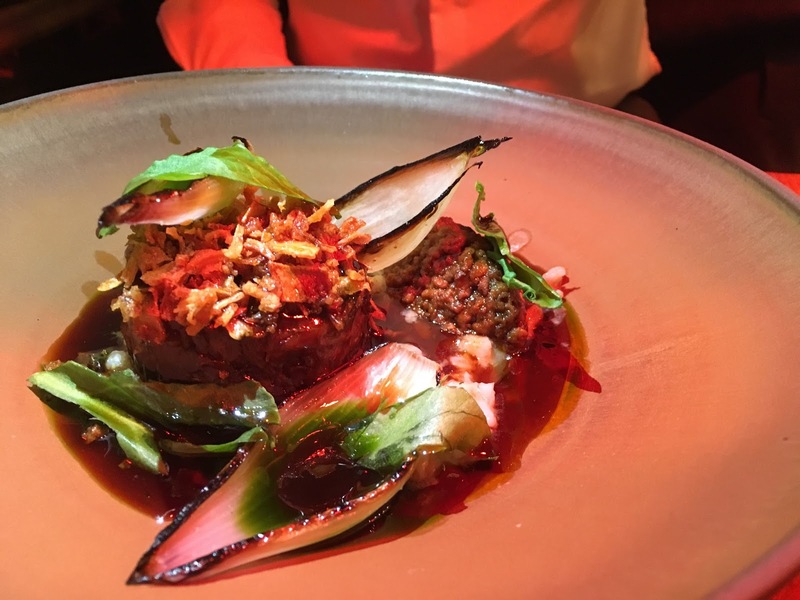 The meat was slow-cooked and shaped into a roulade, topped with crispy fried shallots. It was terribly overseasoned; one side was much worse than the other, as I was biting into large crystals of sea salt. Even on the side that was not studded with a salt crust, the thick gravy was too strong and it killed the goat. The ragu mixed with grains was quite enjoyable with the it's forkful, then I was reaching for water again. There is a distinctive difference between intense meaty flavours and just downright salty, this was no doubt the latter. The portion was fine though. It was alright, the ice cream tasted much like vanilla, especially with the thick sickeningly sweet paste of 'burnt honey' curd on the side. The menu was confusing. We were told that it was designed for sharing and so they recommend 3 or 4 dishes per person, and like a tapas restaurant, it was split into fish, meat and vegetables sections. But then within each category, some dishes were intended to be a starter portion. Service was atrocious. As well as their lack of knowledge in the menu. Staff don't use trays for drinks - I'm okay with that. But the lady held my wine with the bowl of the glass in her palm - that, I don't like. It's not mulled wine, it doesn't need warming up. The other guys standing round the place were more like bouncers than serving staff, carried an accusatory tone when clearing the plate. It was nice when the chefs brought the dishes out themselves, though they don't say any more than what it does on the menu. We finished our evening with some Orange Buffalo Wings from the food truck park. For some real food. Definitely not coming back to The Frog. Tucked away on one of the quieter streets in Soho, Blanchette was buzzing inside with a full house. The tiled bar, brick wall, wooden cabinet and furniture gave a cosy rustic feel to the dining room, just like the classic bistros in the more local neighbourhoods of Paris. Our friendly server came to take our drinks order and explained the menu to us. We decided to pick 3 each from the menu to make sure we have some space left for dessert. Frog legs are not dissimilar to chicken, just more tender and succulent. The tangy cherry tomato based sauce mixed with tarragon kept the deep-fried snack light and appetising. Another item from the specials menu. The crispy shell enveloped a a small ball of slow-cooked shredded lamb that was soft and juicy, went well with the piquant peppery aioli to give it little fiery kick. This tart was full of surprises; a thin stretch of light and airy filo pastry with buttery fragrance, spread with a layer of caramelised onion, topped with plump, garlicky, succulent mushroom and crunchy roasted leeks, draped over with gooey melty pungent soft cheese, finished with a runny poached egg. It was all the perfect flavours in one mouthful. This was possibly my favourite of the evening. The scallop was unremarkable. There was more breadcrumbs than scallop and all I could taste was butter-soaked, slightly burnt crumbs. Because I can’t say no to tartare. This was textbook tartare, the raw beef chopped just fine enough to be smooth but large enough to retain its bouncy chew, perfectly seasoned and dressed with a touch of pickles to lift its flavours. The poached egg was semi-cooked through to a soft gooey yolk, that was delicious with the pungent anchovy alone, slightly different to the conventional raw yolk but it worked for me. The skin of the thick hake fillet was pan-fried to brittle crispiness, served on a bed of smooth cauliflower puree. 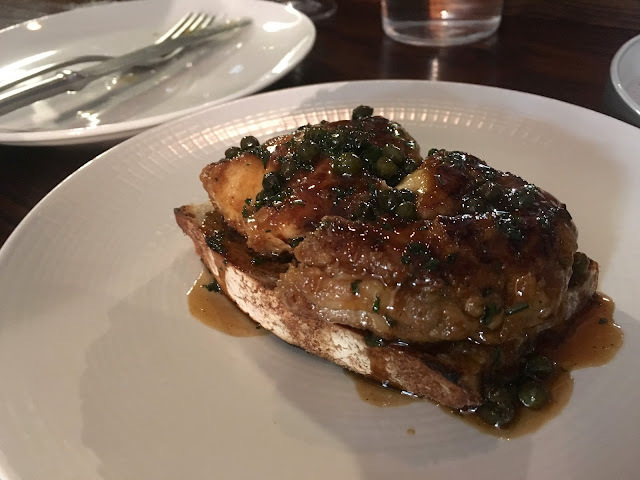 A la Grenobloise refers to a browned butter sauce mixed with capers, parsley and lemon, with some croutons thrown in. Our server poured the sauce over the fish and it brought the dish to life. The rich buttery grease was lifted by the lemon and herb in the sauce, and was a natural match to the slithery fish that was perfectly undercooked. Perhaps there was a bit too much sauce, as it got very heavy when it drowned the puree, but delicious nonetheless. The partridge was exquisitely roasted, the bird was tender but firm in texture. The kale wafers crumbled and made up for the lack of crispy partridge skin. It was the white beans that ruined it for me; I just don’t like beans. It’s me. The rotund of lamb shoulder collapsed into soft shreds as we dug the knife in, absorbing the meat jus and soaking up more flavours. The mushy garlic clove with subtle hints of rosemary complimented the lamb perfectly, balanced with the natural sweetness from the onions in the sauce. I found it a tad too salty with the addition of anchovy, perhaps an unnecessary touch. Jer had her eyes on this specials dessert the moment we sat down. Can’t go wrong with a creme brûlée. Our dessert took a long time to arrive, our server explained it was because the first fondant didn’t turn out with a runny centre so they had to redo it. Fine. It was a good fondant with a molten lava of hot chocolate, cake was moist on the inside and slightly crumbly on the outside. It was perfect with the pistachio ice cream. We had a fantastic evening at Blanchette. The food was delicious with great variety and perfect for sharing. Perhaps as the meal went on, the dishes were starting to feel heavy, especially after the hake with brown butter sauce. 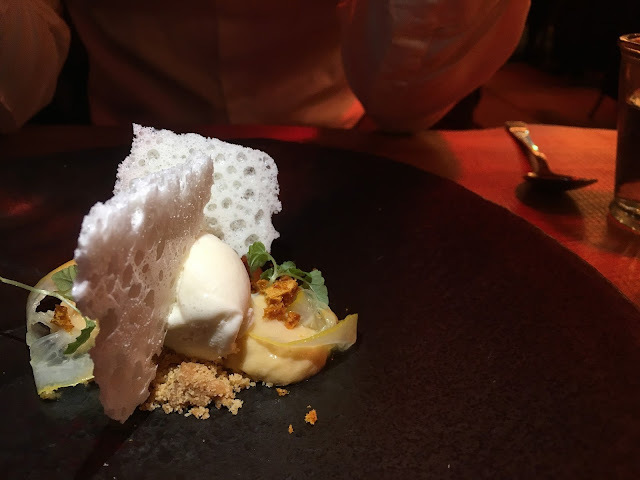 But then again, in classic French cuisine, chefs never shy away from generous blocks of butter, a healthy sprinkle of sugar and a casual dollop of cream. Sure things will be fine if we wash them down with enough red wine. Reminds me of the big chef in a Ratatouille-like kitchen. Great evening in a little slice of Paris – excellent choice Jer. We arrived at Warsaw at 5:30am by the overnight bus from Vilnius, bang in the centre of town before the city wakes for the day. I think we were both very surprised by how Metropolitan the Polish capital turned out to be. Mind you, I had spent 3 weeks in small towns and villages, so the city buzz took a bit of time getting used to. 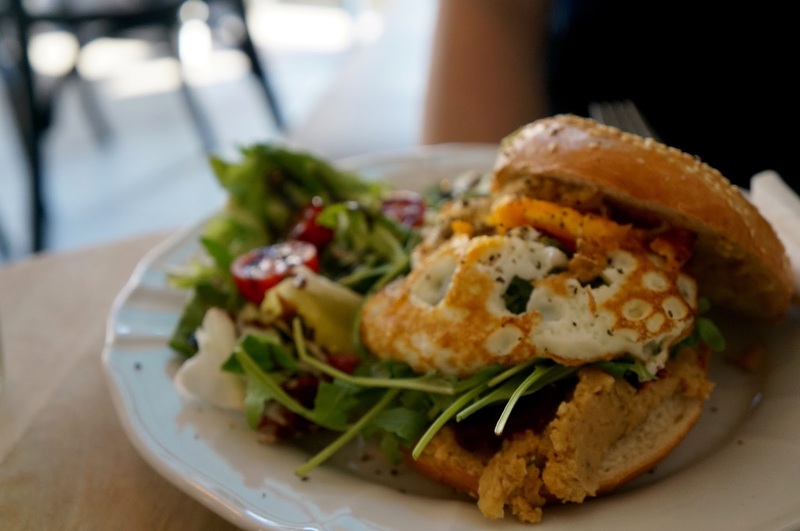 He looked up a list of cool-eats in Warsaw, including a few trendy breakfast spots. However most don’t open at 6am. So we began wandering around the sleepy city, made our way towards the general direction of our accommodation / breakfast café via Old Town. IT took us just under 3 hours, going through random parks and neighbourhoods, but we got there. Café SAM came recommended for their fresh bread and bagel. We had their traditional Polish breakfast set and Egg & Bacon Bagel with fresh orange juice. The bagel was out of this world; so much so that he declared he could have this everyday – toasted bagel smeared with a thick coat of cream cheese, layered with fresh salad leaves, juicy tomato, small pile of smoky bacon and topped with a fried egg with a crispy edge; the runny custardy egg yolk trickled onto the bacon, the bread mopping up all the savoury goodness… damn it was a good bagel. The traditional breakfast set was comparatively less exciting with a Viennese egg, cottage cheese, ham, cheese and pickles, served with homemade sourdough bread. Still very enjoyable and very substantial. Our room wasn’t ready, so we dropped off our backpacks and made our way to the Warsaw Uprising Museum by tram. The tram system was somewhat flawed; ticket machines were only found on some trams and the occasional stops, and were we lucky enough to hop on a tram with a machine, they only took coins… so while we had every intention to pay, circumstances were a limiting factor. We only had enough change for 1 ticket, lucky it was only a short ride. There were a confusing number of uprising events in Warsaw, the Warsaw Uprising Museum focuses on the 63 days that Polish Resistance army fought against the Nazi with very little weapon while the Soviet Army watched on the sidelines. The setup was quite interesting with information displayed in different ways, but the flow of the exhibition was quite disorganised. Perhaps we were tired, the presentation was starting to blend. Milk Bars are local eateries that serve cheap Polish meals, not dissimilar to a canteen. Many restaurants were closed down post-war by the communist authorities, but these simple milk bars subsidised by the state remained to serve dairy-based meals to poorer working class. Nowadays they are just self-service eateries offering traditional Polish dishes at low prices. 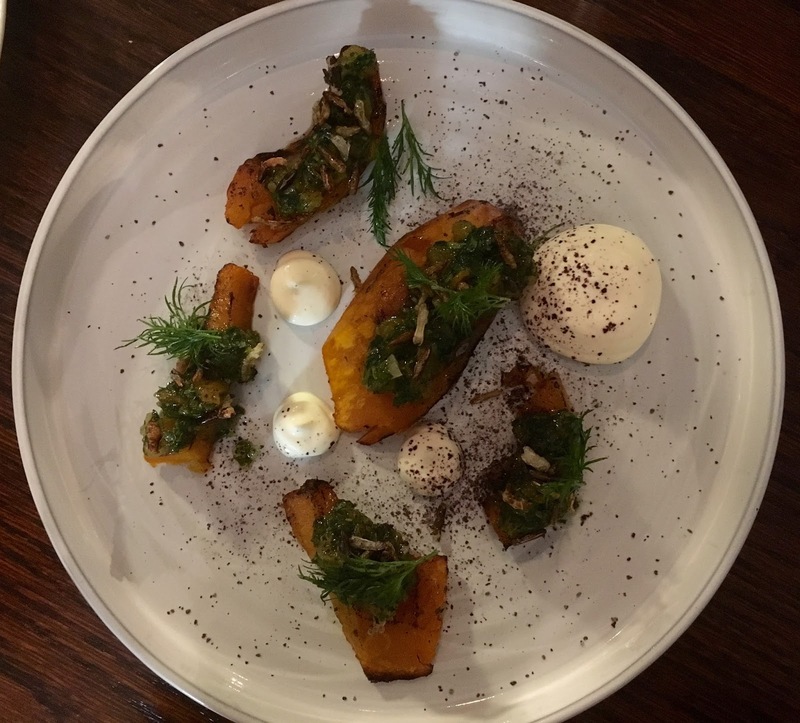 We picked Bar Prasowy because it’s relatively central and more importantly they have an English menu. We placed our orders at the cashier, took our receipt to the kitchen counter and the staff began loading our tray with food with utmost efficiency. We wanted to try some pierogi but they ran out, so we had pork hock with pickled cucumber soup instead, finished with strawberry and cream pancakes. The hulk of pork knuckle wasn’t bad, plenty of meat and reasonably tender, perhaps a little bland and it could do with some gravy. The soup was an acquired taste, sour and salty, but it was the pancakes that had our eyebrows wiggling. The thin crepes were overstuffed with half a can of whipped cream, then drowned in a crazily sweet strawberry couli that was probably made from a jar of jam. It’s standard canteen food but we’re glad we’ve ticked the milk bar box. Then it was time for a nap back in the apartment before our dinner reservation at Atelier Amaro - the first Michelin star restaurant in Poland. See full review here Atelier Amaro. We took a little detour to Chopin Monument too. The following day we started with a couple of breakfast bagels at Bułkę przez Bibułkę. the egg and bacon bagel was good but not as epic as the one at SAM, and the Hummburak bagel with hummus, beets and eggs didn’t go down well with him. We joined the free walking tour the the Old Town, where our guide explained how the entire city was more or less demolished during the war and tried brainwashing us to believing Warsaw is a better city than Krakow. That’s the thing, we had to go with what he said. It was overall quite a good tour, we got some good background on the uprising events and treatment of the Jewish in the ghettos. We finished the tour at the Uprising Monument. Although we knew most restaurants in the Old Town area were catered for tourists with questionable quality, we decided to have lunch at Zapiecek, a chain that serves traditional Polish dishes with waitresses in ridiculous outfits. He watched a pierogi blind-tasting video on Youtube that reported this chain does the best dumpling. We chose a selection from the list with sour cream topping, a potato pancake and some sour rye soup. Food was quite good, though Polish dumpling will never be as good as Chinese ones:) I thought the potato pancake and soup were delicious. We wandered along the main strip of Old Town and Nowy Swiat. Apparently Lody Prawdziwe serves the best ice cream in town. That’s the thing - best ice cream in Poland may still just be 'alright' ice cream by Italian gelato standard. It was alright. Having spent enough time rubbing shoulders with tourists, we decided to cross the river to the East side of the city. The Soho Factory is an trendy industry park for creative businesses. Sadly most museums close on Tuesdays in the city, so we had to miss out on Museum of Neon Lights. Instead we just wandered around the park and checked out a few furniture shops. Bars are abundant in town centre; alcohol is cheap. At £1 a shot or half-pint or small glass of wine, we sampled their extensive offerings and nibbled on their bar snacks – steak tartare(!) , pierogi, spicy sausage, all for £2. That’s the thing, even at that price point, food was still pretty good. It’s like Weatherspoon in London, but cheaper and better. The following morning we made our way across town to catch the 8am Polskibus to Krakow (c.£4 pp; 5 hours). We were dropped off at the main bus terminal, just next to the train station. Seeing the apartment wasn’t ready for check in, we walked over to the Jewish Quarter. At first glance, this area is a bit run down, a bit grotty, a bit messy. Upon a closer look, it was packed with trendy cafes and stylish bars, hidden behind unassuming doors. We went to their market near plac Nowy, a small square with food stalls selling the much-loved local zapiekanka, which is an open-face baguette topped with mushroom, cheese and ketchup. It was a very popular lunch spot with tourists and locals. We chose Endizor coz it had the longest queue; I had a spinach one and he went for chicken with crispy onion. It was tasty, the hot crusty bread was super soft inside, delicious with melted gooey cheese, not dissimilar to pizza. Mine was a bit plain and got quite boring half way through though, he made a better choice. After checking in, we rested before joining the 4pm freewalking tour. Our tour guide was excellent, very engaging and entertaining with interesting facts about the city. She didn’t spend as time slating Warsaw as the guy in Warsaw did to Krakow. Probably because there were more interesting things to tell us about the old town area. We started at St. Florian’s Gate and learnt the significance of the McDonalds that symbolises the end of Communism for the Polish, made our way to the huge market square to watch the trumpet player perform his hourly duty above St. Mary’s, before taking a break in the university courtyard. Our guide Anya told us great stories of myths and urban legends. Then we ventured south to where the Pope stayed during his visit, followed by the Wawel Royal Castle and Cathedral, where we finished the tour and watched sunset. For dinner we went on a little quest to find the Skwer Judah food truck park. Andrus serving maczanka (pulled pork sandwich) was stunning, Pan Kumpir was less exciting with their jacket potatoes, but satisfying nonetheless. For dessert, we had a Chimney Cake stuffed with orea ice cream, topped with whipped cream to push our calorie count way over the edge – it was amazing. The street food culture in Krakow was awesome. There was a Singer Bar near the market that had a Singer sewing machine and candle on every table. It was quite a cool little bar with locals dancing away… until my hair was caught by the candle…eek. 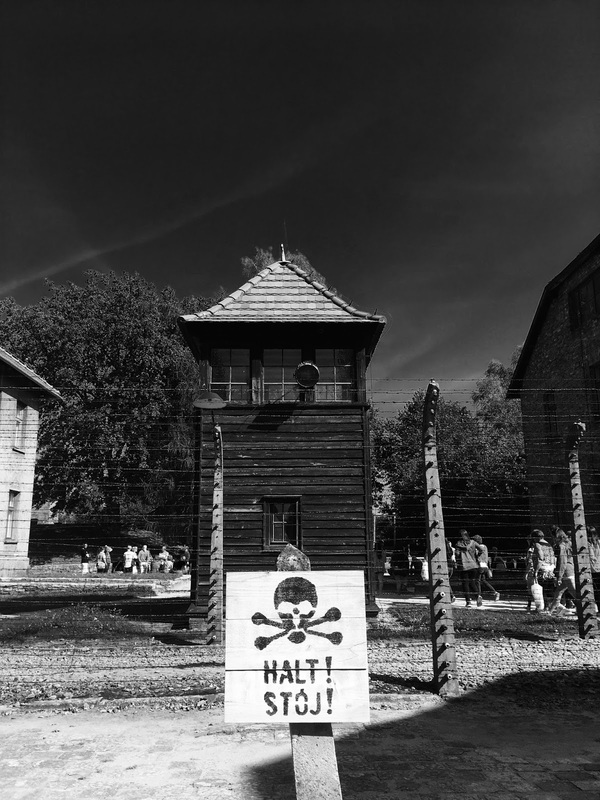 The following day we went to Auschwitz Concentration Camp museum. There were multiple buses that go to Oswiecim every hour; we took the big Lajkonik bus (14zl, 90mins). Entrance is only free before 10am or after 3pm, when visitors could enter and visit the Auschwitz site without a tour guide. After 10am, visitors must join a tour group (45zl). We got there around 9:30am and enjoyed browsing at our own pace. The Auschwitz site looked so ordinary at first. It wasn’t until we crossed the barbed fence and started entering the buildings before its sombreness struck me. I honestly struggled with the experience. It was mostly psychological, but the smell inside the buildings, the mountain of hair, the pile of shoes and the thousands of photos that lined the walls – I felt sick. 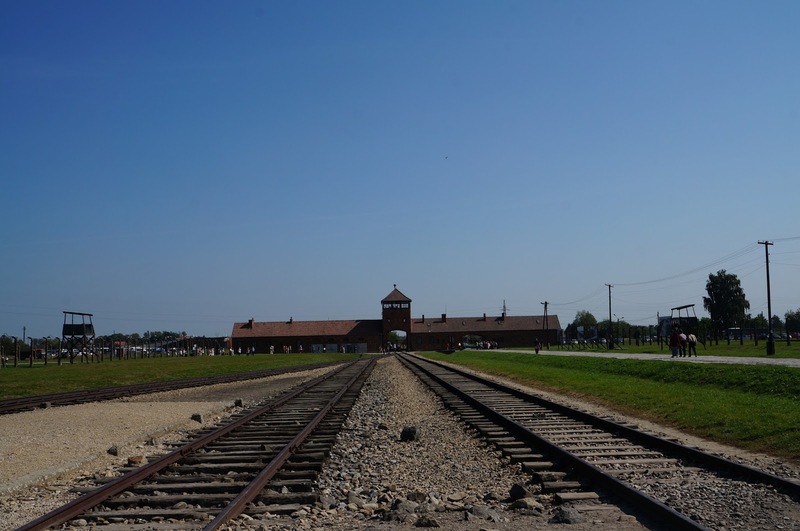 There was a free shuttlebus that transported visitors to Birkenau camp, which was much bigger than Auschwitz. We walked along the railway tracks that brought in prisoners, endless rows of barracks, gas chambers and ponds where the ashes were dumped. We returned to Krakow by the same bus, and had a late lunch at Charlotte’s, a French bakery-café. Meh. He decided he wanted to see the Schindler’s Factory and Mocak art museum. It closes at 7pm so we had about 90mins to do both. *The factory does not exist anymore – it’s only a museum called Schindler’s Factory nowadays* It was yet another war-related museum, as if the visit to the concentration camp wasn’t traumatic enough… I was WWII-ed out. After a couple of drinks and nibbles, we looked for the hot dog truck that setup shop on the roadside with an open fire after 8pm. There was a short queue of leather-clad bikers, waiting for their crispy skin sausage… like a secret foodie cult… Apparently the owners have been grilling dogs at the same spot for 17 years. On the final day we decided to get away from war-related sights and headed to Wieliczka Salt Mine. We started the day with breakfast at the cool Jajownia for some scrambled eggs. It was a short 30min bus ride on local bus, just opposite the Galleria shopping mall. This was by far the most expensive attraction with a steep 89zl entrance fee that comes with a mandatory guide. The tour started with a 378 steps descend to 64m below ground and was lead through a series of ridiculous sculptures. It was really quite disappointing until we reached the cathedral – which was the largest underground church in the world. After the 90-min tour, we were given the option to see the museum underground with another guide, or head out. We went around the various facilities of the salt mine, including a 4D cinema and a dining hall, before joining a 5-people tour of the museum. So glad we did, this was so much better than the first one. We couldn’t grasp the size and scale of the mine until we saw this diagram, the red showing the few kilometres that our tours covered. Oh, it was really quite cold down under, around 16 degrees when it was 28 above, make sure you bring a coat. After grabbing a hearty kebab, we made our way back to Krakow. We had some time to spare so we quickly checked out the modern Galleria shopping mall, before jumping on the train to the airport (8zl, 20mins). 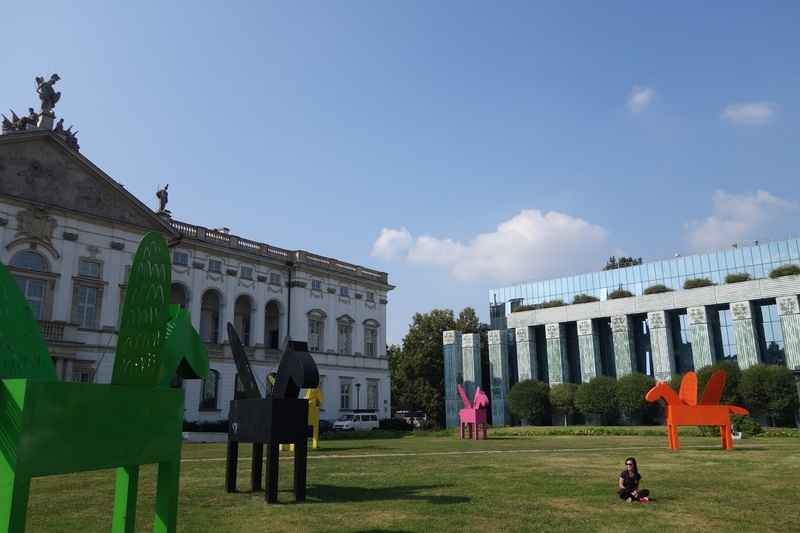 Despite the heaviness of the war exhibitions, the two Polish cities were pack with fun and variety of things to do. 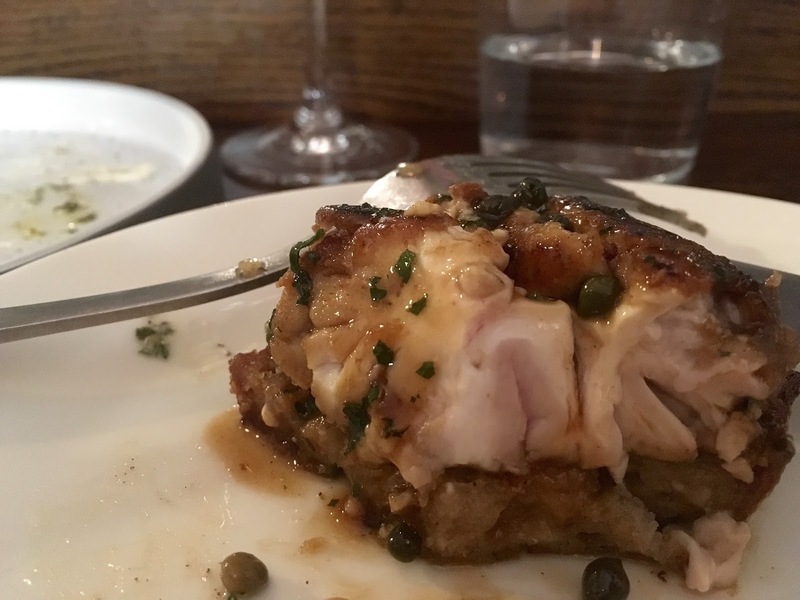 There was a good mix of old and new, and food was astonishingly delicious - there’s way more on offer than the traditional pierogi and potato cakes. I’d love to come back some day to see smaller scenic cities and appreciate modern Poland. How I’d missed Europe. So happy to be coming home with you.